When I heard Artistry was opening their 2017-2018 season with Joseph and the Amazing Technicolor Dreamcoat, I thought, "Why?" Why are they doing this frequently produced show now, and why do I need to see it again when I've seen it so many times (the Chanhassen alone did it seven times in three years, or was it the other way around?). But I did go, and I'm thrilled that I did because this is a Joseph and a Joseph unlike any I've ever seen before. The familiar score and story are seen through a new and different lens. 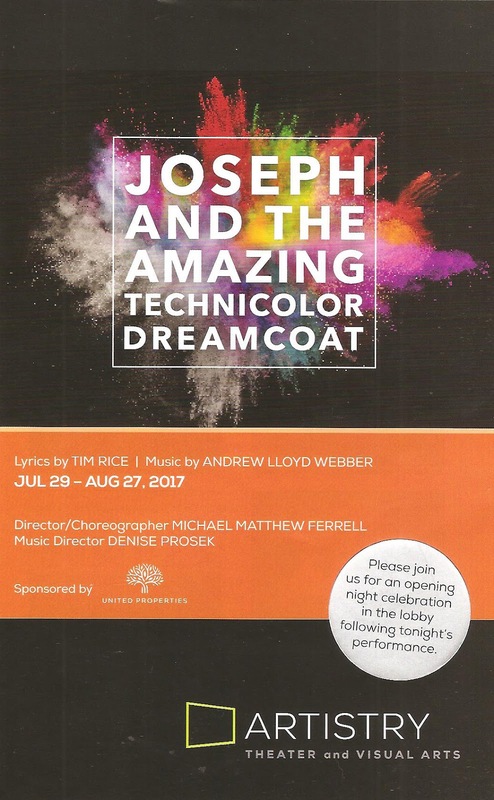 Direction, choreography, staging, set, costumes, music, casting, and performance all contribute to the most inventive production of Joseph and the Amazing Technicolor Dreamcoat I've ever seen. It's pretty far out, and if you're an Andrew Lloyd Webber traditionalist, you may not be pleased. But I dug it. Read on to find out why I did, and why you might too. 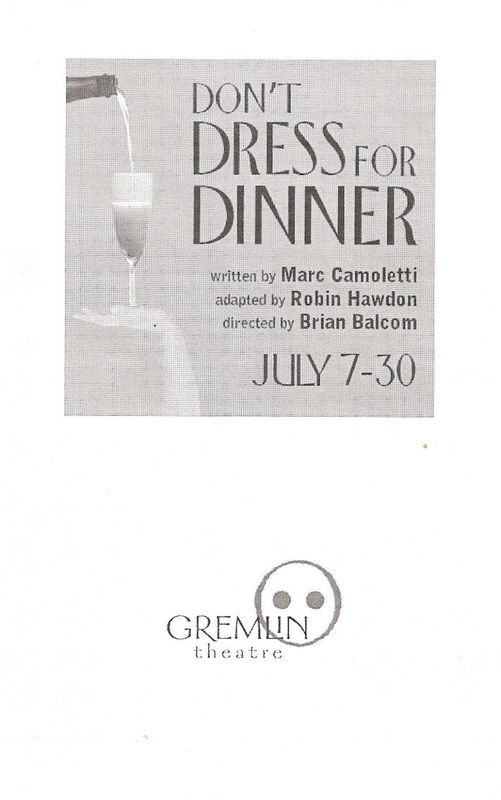 Friends, support your local community theater! In the beautifully rich theater community that is #TCTheater, there is a ton of great work being done in high schools, community centers, churches, and other locations around the Twin Cities metro area. Most of which I don't get to see because I'm too busy seeing work by the 70+ professional theater companies. 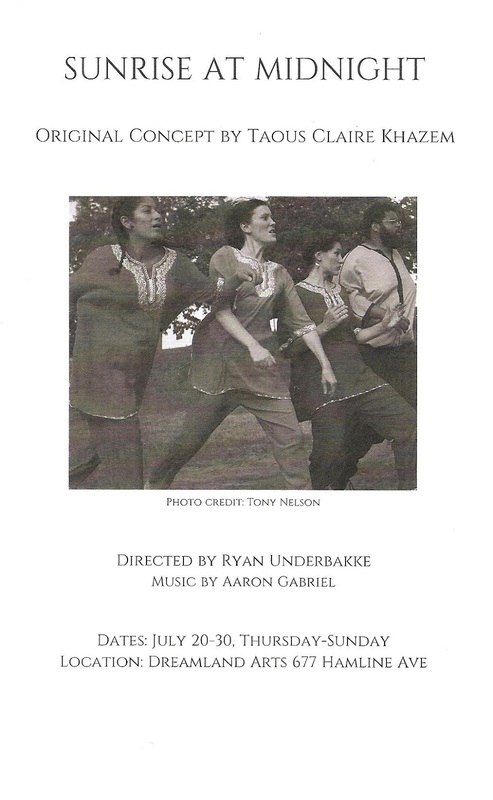 But lucky for me, my local community theater is Mounds View Community Theatre, which does a musical every summer. And lucky for all of us, the director of this year's selection, the delightfully silly Gilbert and Sullivan operetta H.M.S. 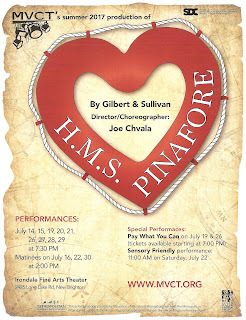 Pinafore, is one of the Twin Cities' best director/choreographers Joe Chvala. I saw the show on their closing weekend and was absolutely delighted by it from start to finish. 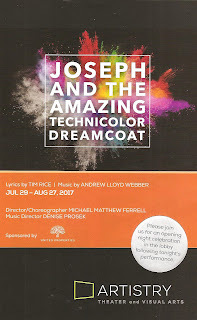 Joe Chvala's energetic and dynamic choreography combined with this amazingly talented and hard-working cast of "amateur" performers and designers, not to mention all the behind the scenes volunteers, adds up a whole lotta joy and rapture for this audience member. "I think comedy is disarming. I mean literally. You let down your armor so you can laugh. And if you laugh, you're taking things in. I want people who disagree to watch this play and be able to laugh at themselves." Mission accomplished. 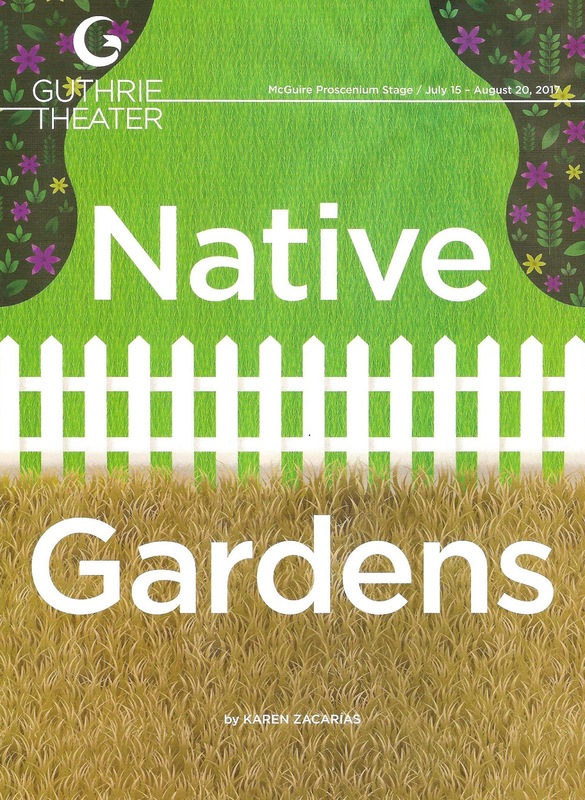 The new play Native Gardens by Karen Zacarías (from whom this quote comes), now playing on the Guthrie proscenium stage, accomplishes this and more. Through the lens of neighbors disagreeing about a fence, she exposes our many prejudices, fears, and defenses. Everyone in the audience can recognize themselves and the prejudices they harbor, or the ones they've faced, and laugh at the ridiculousness of it all. 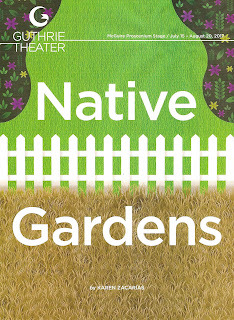 The two couples in the play are on opposite sides of many issues, but through this dispute they eventually come to realize that despite their differences they both want the same thing - a nice yard to live in and friendly neighbors. There are a lot of great #TCTheater summer musicals this year (many of whom responded to my #Ham4All challenge - watch all the videos here): the Ordway's fan-freakin-tastic Jesus Christ Superstar, the gorgeous Sunday in the Park with George at the Guthrie, the recently closed infectious new musical Fly by Night at the Jungle, Old Log Theatre's better-than-Broadway Ghost the Musical, History Theatre's third run of the smash hit Glensheen, and the super fun Grease continuing at the Chanhassen through the fall. 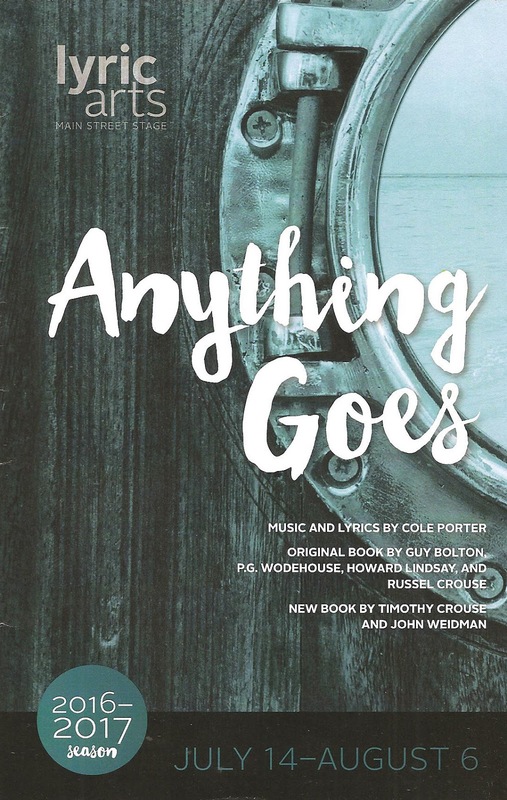 Here's another one to add to the list (especially for those of you who live on the north side of town) - Lyric Art's ebullient production of the Cole Porter classic Anything Goes. A wonderful cast, that catchy and familiar score, hijinks and humor galore, and tap dancing! 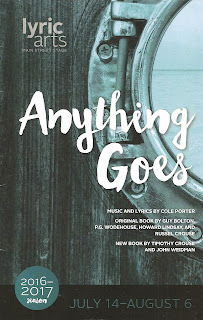 It runs through August 6 so if you can get tickets (Lyric Arts' musicals sell well), I recommend a visit to lovely Anoka to see this great summer musical. Just one question remains - can they #Ham4All? One of the things I most appreciate about theater is the opportunity to learn about cultures different from my own. Where else am I going to experience Algerian folktales? #TCTheater artist Taous Claire Khazem* has brought the folktales of her father's native land right here to St. Paul, and recruited some of her fellow artists to tell the stories in an inventive, engaging, and movement-filled way. Sunrise at Midnight can be seen for eight performances only at the charming and intimate Dreamland Arts, and the performance I attended was sold out (or very nearly), so act fast to catch this unique theater offering (info and tickets here). 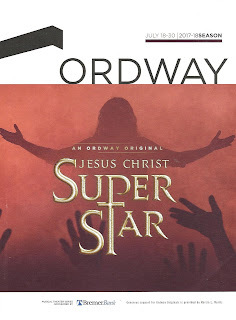 The Ordway's recent string of excellent locally produced Broadway sized musicals continues with the popular Andrew Lloyd Webber/Tim Rice rock opera Jesus Christ Superstar, and it's fan-freakin-tastic. 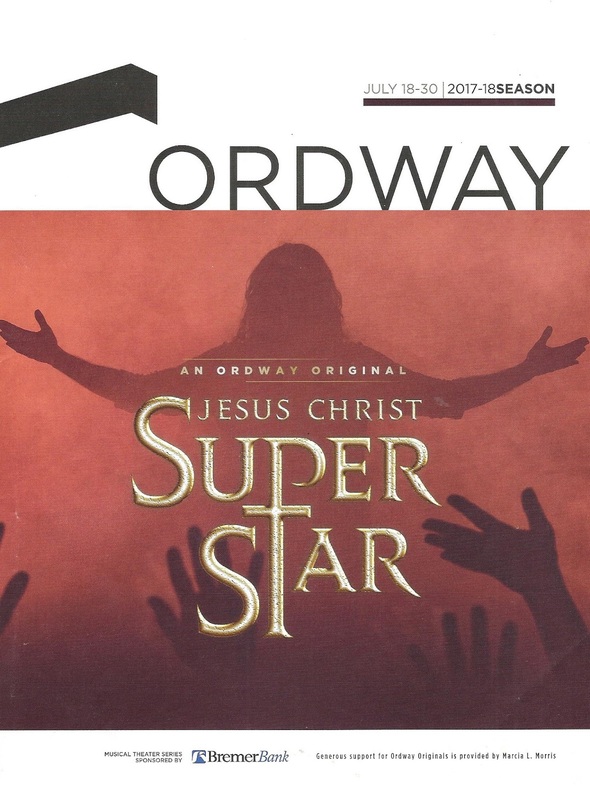 Unlike the Ordway's last original, West Side Story, Jesus Christ Superstar is not one of my favorites; I've only seen it once before and never really listened to it (although I vaguely recalled singing a song from the show at a Catholic grade school concert wearing a t-shirt with an awesome '80s iron-on decal). So I went into the show last night with mostly fresh eyes. I still think the piece is a bit weird (the heavy story of the life and death of Jesus, with a comic number and a disco thrown in), but there's something kinda fabulous about it. And the number one reason to see the show at the Ordway is this mostly local cast that is absolutely spectacular. The show is completely sung through, most of it at full volume, and everyone in the lead and featured roles just knocks it out of the park. And every member of the 30+ person ensemble (including several sweet-singing children) completely gives it their all. Notably, this cast is racially diverse (including an African American Jesus*), a beautiful example of color-conscious casting by the Ordway. At this moment in time when our country, our world, is more divided than ever, it's heart-warming to celebrate an inclusive, loving community of diverse peoples. And isn't that what Jesus taught, before his message was distorted, used, abused by institutional religions? Not exclusion but inclusion, not us vs. them but the idea that we are all one, we are all special, we are all worthy of all the bounties that life has to offer. If you're a musical theater geek like me, or just someone who's aware of pop culture and particularly social media challenges, you've probably heard of and enjoyed Lin-Manuel Miranda's #Ham4All challenge, in which celebrities and normal people post a video of themselves singing a song from his brilliant creation Hamilton, donating $10 to the Immigrants We Get the Job Done Coalition through prizeo.com/hamilton, and challenging two others to do the same. It's been a ton of fun to watch all the contributions to #Ham4All (just search the hashtag on any of the social medias to see all the wonderful contributions), but of course I wanted to see my favorite #TCTheater artists do it! For the past five years, Mill City Summer Opera has performed an opera outdoors at the Mill City Museum Ruins Courtyard, a stunning location in which to experience opera. This year the Courtyard is under construction, so they made the best of the situation and are instead performing in a historic building across the river, an event space called the Machine Shop. For this small indoor location they've chosen a 20th Century, three-person, small orchestra piece, in contrast to their usual classical, large cast, full orchestra pieces. The opera is perfectly suited to the space (and reminds me a bit of what Skylark Opera has been doing lately), and the experience, while different than outdoor opera in the Ruins Courtyard, is just as thrilling. 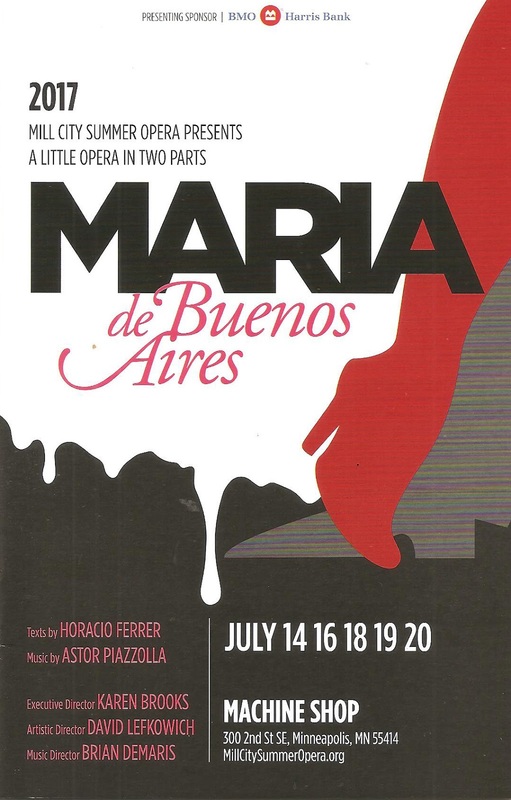 On a hot and steamy summer night, Maria de Buenos Aires is a hot and steamy little opera that is positively hypnotic in its poetry of sound and movement. It sure feels like the dog days of summer, which means that the Minnesota Fringe Festival is soon to be upon us (August 3-13 to be exact). 11 days, 15 venues, 167 shows, and a whole lotta crazy fun! If you're a Fringe newbie, read on, I have a few tips for the uninitiated (I know it can be overwhelming, but just jump in!). But before that - I've read through the list of shows (and attended the first Fringe Preview, in which 30 shows present a 3-minute excerpt) and marked about 60 that I want to see. Alas, the maximum one person can see is 56, and my goal is 40-50, so I'm going to have to whittle that list down somehow. But the below 20 are at the top of my list (in alphabetical order), so hopefully the Sudoku puzzle that is my Minnesota Fringe schedule will work itself out accordingly. Read on, add your suggestions below, and Happy Fringe! 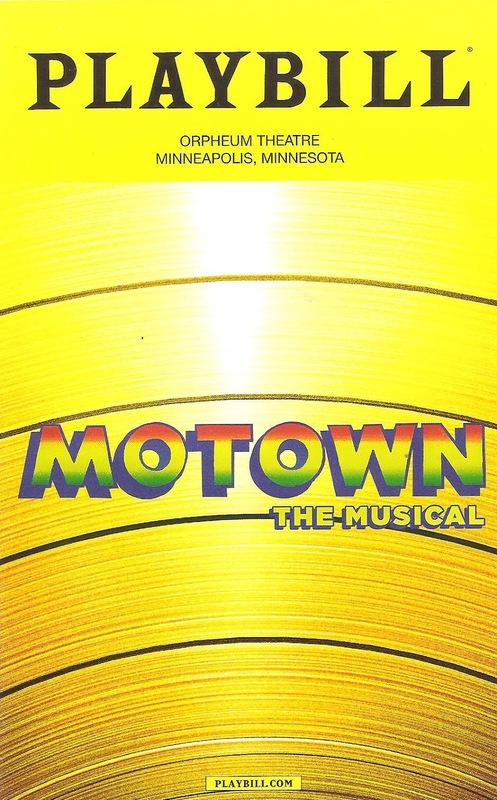 Motown the Musical is a rip-roaring race through 25 years of music history that may leave you with a slight cast of whiplash, but will also leave you with a whole lot of great tunes in your head and a smile on your face. Anytime you try to shove that much history into that short of a time, it's going to feel more like a surface overview than an in-depth look, and this does. 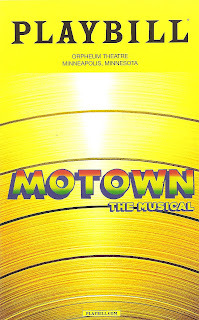 But it's a thrill to hear these iconic songs and watch the iconic dance moves live before our eyes (I wouldn't consider myself a particular fan of Motown, but yet I knew nearly every one of the more than 50 songs in the show, that's how pervasive this music is in pop culture). The Motown era was important not just to music history but also to sociopolitical history, and the musical pays homage to that, albeit in a quick and high-level fashion. The audience at the Orpheum Theatre last night was decidedly more diverse than I typically see there, and this is a rare musical with a largely African American cast, both of which are worth celebrating. And Motown the Musical (at the Orpheum through Sunday only) definitely feels like a celebration - of the music and the people who love it. Good news friends, Gremlin Theatre is back with a new performance space in St. Paul! Four years after losing their space on University and Raymond, which also hosted other theater companies and the Minnesota Fringe Festival, they've opened a brand new space just a few blocks away on Vandalia (although they've continued to do shows at other venues in the intervening years). They are continuing to make improvements to the space that includes a spacious lobby and an intimate thrust stage, conveniently located near the Green Line, just off highways 94 and 280, and right next door to Lake Monster Brewery, whose libations can be brought into the theater. And there's also free parking! What more could you ask for from a theater space? Just one more thing, and that's great theater. 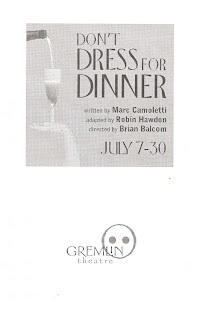 The inaugural production at the new Gremlin fulfills that last requirement - the hilarious and tight comedy Don't Dress for Dinner (which was the first show they did nearly 20 years ago, read more about that here). It's a really funny and fast-moving show with a fantastic cast, and a great way to christen this exciting new St. Paul theater space! This is my third summer seeing Classical Actors Ensemble's delightful Shakespeare in the Park, and I'm convinced this is how Shakespeare is meant to be seen, at least the comedies. Playful, approachable, bawdy, musical, outdoors, accessible (read: free) to all, and 90 minutes long. The Comedy of Errors is a silly farce of a play and a perfect choice for this annual event. This charming and entertaining cast makes the convoluted story (relatively) easy to follow and the Shakespearean language clear and compelling. 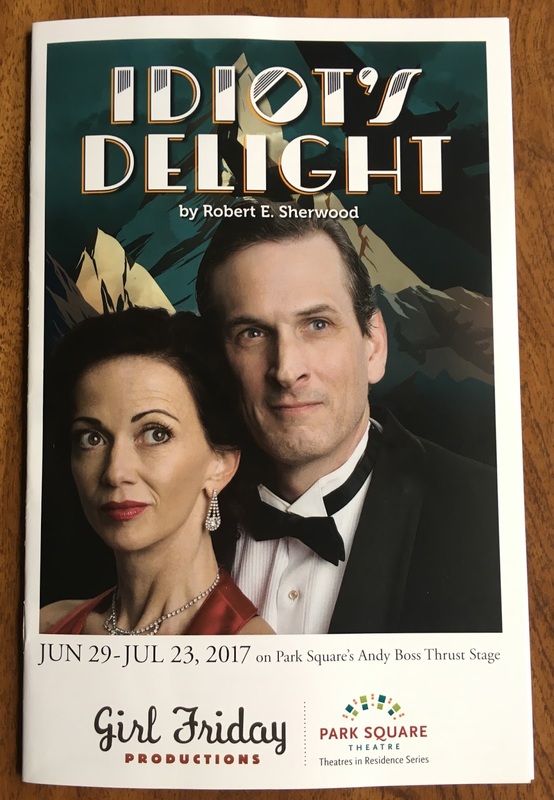 Performances continue at parks around the Twin Cities through July 23, and I highly recommend it as a fun outing for all ages, enjoying the best that Minnesota has to offer in terms of summer weather and great theater. The performance is free with no reservations required, just show up with a blanket or lawn chair, and maybe a picnic lunch, and be ready to be entertained. Idiot's Delight is one of those deceptive plays that makes you think it's a light and fun romp through the past, until you begin to see the seriousness behind the beautiful clothes and pretty music. WWI vet Robert E. Sherwood's play premiered in 1936 and is eerily prescient about the impending war in Europe. Or maybe not; maybe it was obvious at the time that the world was heading to another Great War, only 20 years after the first one. But even now, 80 years after it was written, the themes of nationalism, loyalty, changing borders, and a great sadness at the cost of war on all sides ring true. This one left me feeling a little depressed, but with much to contemplate, and also thoroughly entertained, as always, by Girl Friday Productions' biennial contribution to the #TCTheater world. Girl Friday specializes in "larger scale American plays of exceptional literary merit that are less frequently produced today," and Idiot's Delight is indeed a delight, but one that is most certainly not for idiots.